A working wife and mother (Carey Mulligan) comes to realize that she must fight for her dignity both at home and in her workplace. Realizing that she is not alone, she becomes an activist alongside other brave women from all walks of life. The early efforts at resistance were passive but as the women faced increasingly aggressive police action, the suffragettes become galvanized - risking their very lives to ensure that women's rights would be recognized and respected. "It's like being nagged at for 100 straight minutes." 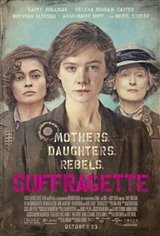 "I'd like to give it a five star rating for the content and portrayal of the women's movement but I can't due to the quality of the film. I missed some of the conversation due to accents and poor sound quality. I will see it again to see if I can improve on understanding more of the conversations now that I know the story. It is a film that should be used as part of high school English or history classes. A realistic reminder of how far western society has come in just over one hundred plus years." "Very good portrayal of the struggle for women's enfranchisement in England." New releases this weekend — Our Brand is Crisis, Burnt and more!